Now, normally I don’t particularly like bees, but it was pretty obvious that these guys were much more interested in the flowers than they were in me, even though I was within just a few inches of them with the camera lens. You can see from the photo above that their pollen sacs were full, so they were pretty preoccupied with what they were doing. I just used my normal 18-55mm zoom lens for these shots without any filters, and at the 55mm focal length I was able to get some pretty decent bokeh effects. 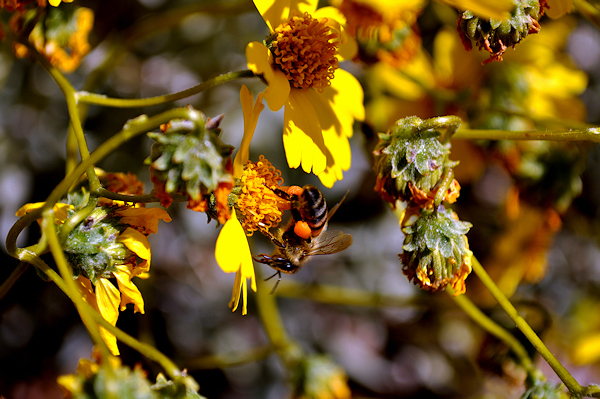 The flowers weren’t the prettiest ones on the bush, but I was after the bees anyway. So, enough of the bees. I have a couple of projects in mind for this weekend. First of all, a small carnival has set up in the parking lot over at Glendale Community College, which is within walking distance of here. My plan is to go there tomorrow night to see if I can get some experience shooting night shots with motion–you know, the typical turning ferris wheel shot. Then, on Saturday morning, we’ll leave for an overnight visit to Arcosanti, where I hope to get a ton of great shots of the area, including some of the red rocks around Sedona. Should be a busy, productive weekend! 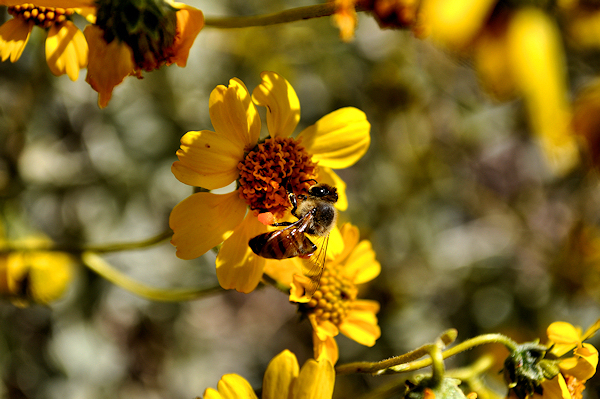 This entry was posted in Shooting and tagged animal, Arizona, AZ, bee, bokeh, camera, D5000, depth of field, desert, Glendale, Nikon, Paint Shop Pro, photography, wildflowers. Bookmark the permalink.